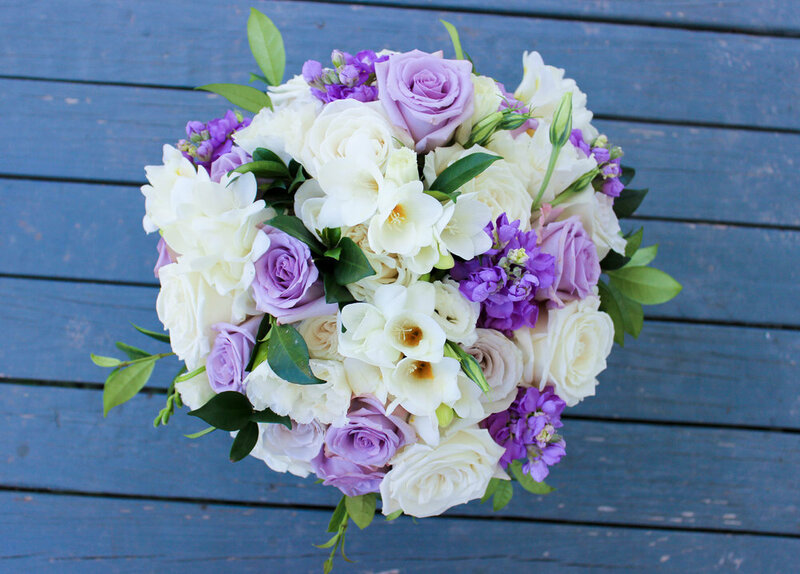 Loren's June wedding featured lovely lavender flowers of freesia, roses and stock! Loren envisioned her bouquet to be mostly ivory and white with a touch of lavender and greenery. We chose ivory and lavender roses, white freesia and lavender stock with jasmine vine throughout. The bridesmaids wore pale lavender dresses and held bouquets filled with bright shades of lilac and lavender with a touch of ivory. The sweet flower girl held a kissing ball filled with matching lavender and ivory spray roses! Matching boutonnieres of lavender spray roses, freesia buds and eucalyptus for the guys. 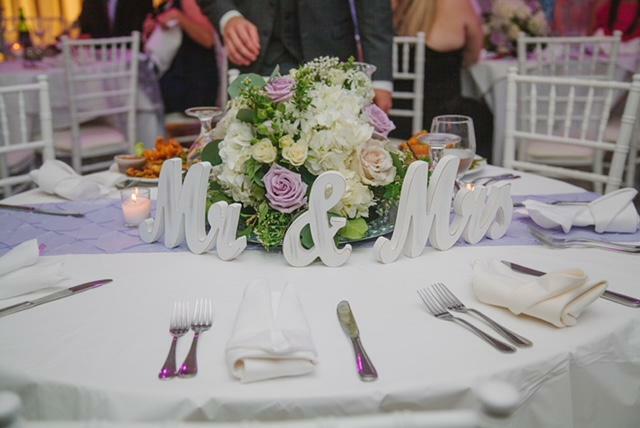 Round garden style centerpieces hugging the table with fluffy white hydrangeas and roses! The style I was going for was a romantic summer feel with shabby chic touches. My husband Brandon and I both liked the color purple and since it was June we went with mostly lavender with off white and silver accents. I found most of my flower inspiration from Pinterest and a few past floral designs you showed me on your Facebook page. My favorite part was seeing everything I hoped it would look like become a reality. I loved the fresh roses and the brooch that was on my bouquet handle. It made a nice keep sake! Also, all the table center pieces for the reception came out beautiful. Thanks to Loren for choosing The Floral Cottage for your wedding day! I really enjoyed working with you and your mom. It was a great experience! Loved your colors, too! :) We wish you and your husband many years of happiness!